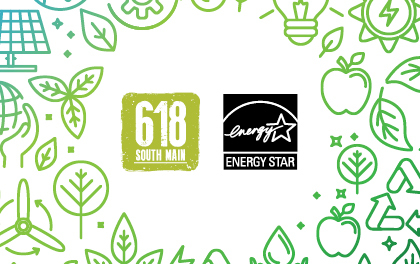 618 South Main Blog: 618 South Main Earns ENERGY STAR Certification! 618 South Main Earns ENERGY STAR Certification! We’re excited to announce that 618 South Main has earned ENERGY STAR® certification from the U.S. Environmental Protection Agency (EPA). The next time you visit, check out the little blue label on display at our entrance – it represents proven, verified superior energy performance over a 12-month period. Thank you for being a part of our sustainability story by taking simple actions to cut energy waste – like turning off the lights in empty rooms. Here’s to another year of cutting energy waste, reducing greenhouse gas emissions, and doing our part to protect the environment – together! For more info about this exciting new designation, check out energystar.gov.